Internalz 1.2 brings Master Mode, an Ipk Installer, a Patcher, and much more! What a wild year it's been! Almost hard to believe that on July 25th, 2009, the world was first introduced to WebOS Quick Install and fileCoaster. Those two programs would end up playing a pivotal role in the homebrew community and to some degree, both exist to this day. A year ago today, the PreCentral forums were welcomed by two new ways to install homebrew applications: WebOS Quick Install and fileCoaster. Regardless of your opinions on them, at the time, they completely changed how peopled viewed the homebrew world. They made homebrew into something that the average user could use, fostering the modern hombrew movement. Lots has changed since then, but for most of us in the webOS community, these two programs hold a special place in our hearts. These were the installers we used when the App Catalog was smaller than our PreCentral Homebrew Gallery. Since their first public release, there's been countless new apps, several other installers (notably Preware and Preload) and we've witnessed the birth of a strong webOS homebrew community. Almost difficult to believe it's been a whole year already. 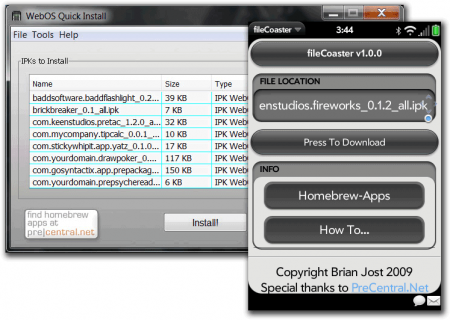 WebOS Quick Install and fileCoaster may not be nearly as popular as they used to be, but today, let's take a moment today and celebrate the 1-year anniversary of their release. Cheers!